If there is one constant in the long-running debate over immigration reform, it is that a majority of Americans are very moderate. Poll after poll has confirmed this over the past several years, and I've posted many of them. The latest example is a New York Times/CBS poll. 65 percent of respondents said that illegal immigrants should be given the opportunity either to become guest workers (21%) or to stay and apply for citizenship (44%). And although in the press it is common to hear about conflicts between Latinos and African Americans, 73 percent of the latter believe illegal immigrants should be allowed to remain in the country. First, the majority of its data is from the 2000 census, which is almost a decade ago. That simply does not reflect current realities. From a policy perspective, you would never try to make a convincing argument with numbers that old. Second, its qualitative accounts are only from 10 people who attended a roundtable in 2007. This is useful for understanding what specific leaders are thinking, but 10 people is not enough to make generalizations. It is very common for people to lionize John F. Kennedy and downplay (or even ignore) his less pleasant qualities. However, it is not something I would normally expect from Fidel Castro. He writes that we can set aside all that invasion and attempted assassination stuff (he shrugs it off, arguing that Nixon would've been worse, and Kennedy was in a tough bind), and instead focus on the fact that a long line of Kennedys, beginning with JFK just before he was killed (or at least he implies this) have argued to allow unrestricted travel to Cuba. I would be remiss if I didn't point out that fellow blogger and political scientist Steven Taylor just published his book on Colombian politics, Voting Amid Violence. Given the controversy swirling around Alvaro Uribe and a third term, it is particularly timely. An interesting development is Ecuador's quiet discussion with the IMF about obtaining loans. Of course, the IMF has long been vilified for its role in economic shock therapy that made no allowances for local realities and needlessly forced many Latin Americans to suffer as a result. But especially in the context of the current economic crisis, however, it has been claiming that its policies are different, that they respect safety nets and are generally more consensual. Rafael Correa had cut ties with the IMF in 2007, but now the drop in the price of oil is starting to hurt, and remittances are also decreasing. He needs to get money from somewhere. He certainly would not take loans with conditions and recently said that it would be "a very serious error to resuscitate the IMF" so if he works out a deal with the IMF, then something is indeed changing. The Institute for Public Affairs (INAP) of the University of Chile invites colleagues to express their interest in filling half and full time non-tenured positions. We seek academics with a trajectory of excellence and combined experience in academia and/or public service, willing to join integrated, pluralistic and multidisciplinary research teams and who are able to demonstrate leadership in analytical and decision-making processes involving diverse academic interests and areas of specialization. The INAP boasts a multidisciplinary academic community, with a broad view of public affairs. These are understood as those related to the State and its institutions, government, public policy and citizenship in a global society. Candidates must possess a doctorate (PhD), or ABD, and/or have a distinguished professional career in the areas indicated; publications in national or international journals, and teaching and research experience. Fluency in Spanish is essential. NOTE: Personal information will not be returned nor filed for future reference. You know that a policy is doomed when Business Weeks publishes an article about how to get around conservative Republicans and start making money in Cuba. However, Fidel's recent comments about "misinterpreting" Raúl also raises the question about how much Cuba will be willing to accept increased economic interaction with the U.S. I thought of this because the Business Week article mentions how Caterpillar is salivating at the opportunity to sell its products when Cuba ramps up its infrastructure to handle the inflow of people once travel restrictions are lifted. How much will the Castros want icons of U.S. capitalism flooding in to make a profit? Can that be squared with revolutionary ideology? Americas Quarterly has links to some Alvaro Uribe quotes regarding his pushing for another president term. He told Jimmy Carter that he is trying to convince his own soul not to run. What I really want to know, though, is how does his soul respond? Obviously his soul has some really good rebuttals, but he does not share what they are. One of them, assuredly, is that his efforts could be lumped in with Hugo Chávez, who he dislikes intensely. President Obama's participation in the summit had two effects you don't see too often: first, to make Fidel and Raúl disagree publicly; and second, to put Fidel on the defensive. After Raúl talked in nice ways about Obama and suggested that Cuba might free political prisoners, Fidel says everyone misinterpreted him. Then he explained the way he wants Raúl to be interpreted. Further, in Granma Fidel wrote a blistering column against the summit's final declaration, a document no one cares about. The success of the summit, of course, had nothing to do with the declaration and everything to do with Obama's attitude. And for Fidel, that stinks. Looking at what Obama has done to date, I'd suggest that his foreign policy doctrine comes by way of Montesquieu -- crudely put, useless conflicts weaken necessary conflicts. To elaborate: the United States suffers from an overextension of its foreign policy obligations. With a weakened economy and a drop in U.S. standing, it is both costly and fruitless for the administration to continue policy conflicts that yield little beyond pleasing those invested in the policy status quo. That last point about the status quo hits the nail on the head. Critics of Obama's Latin America policy argue that things should not change, but literally never explain how not changing is going to further U.S. policy goals. Indeed, how many people really go on the assumption that our policies have been working well? If anyone is interested, I will be on Wisconsin Public Radio tomorrow between 8 and 9 am EST to talk about the summit--its potential implications, reaction in the U.S., etc. "I know how many Latin America countries see Brazil. I know how Lugo (the (president of Paraguay Fernando Lugo), Evo (Morales, Bolivia's president) see us. Brazil is big, so people are always thinking that Brazil is to be blamed for something that happens to them." "We need to respect ourselves so that the big ones respect us too. We don't have to be begging for favors. We need to start taking care of our own noses. We need to stop talking and end this habit of seeing ourselves as small, poor, and that we need someone to rescue us. We might even ask for a loan, but we are the ones who have to deal with our own problems." Hugo Chávez and Daniel Ortega got all the media attention (and I wonder where the "we need to stop talking" comment is aimed) but there is no doubt that close relations with Brazil is a major priority for Obama. These types of statements will facilitate that relationship even more. Obviously, we should not mistake tone for substance, but I can't help but notice that President Obama's sense of humor is useful in foreign policy terms. Both Hugo Chávez and Daniel Ortega wanted to make statements about past U.S. policies toward Latin America, the former giving him Open Veins and the latter making a speech. “I’m grateful that President Ortega didn’t blame me for things that happened when I was three months old,” Obama said. Humor may in fact be the perfect way to communicate with Chávez, who jokes all the time. I spoke to a reporter from a local paper about the changes the Obama administration has made with regard to Cuba policy. He just wanted background to help readers figure out how we got to where we are. It struck me, though, that in the blogosphere and in academia we often complain about the tentative nature of the changes, but we don't acknowledge that the mere fact that changes are taking place puts Cuba policy into the public eye. The debate over the failures of that policy is now more prominent than ever. From a practical standpoint, it is likely that support for more changes will grow. It will be interesting to see how public opinion over the embargo, travel, etc. changes now that people are thinking about the issue more. "There's no indication that the numbers leaving have gone up," Passel said. "The best thing we can do with our data is say that the overall numbers have stopped growing." The sad part is that anti-immigrant groups are pleased, seeming not to understand the logic behind all this. "That means that North Carolinians will have a better chance of getting jobs that really belonged to them in the first place," said Ron Woodard, head of N.C. Listen, a citizen group that advocates for a crackdown on illegal immigration. Um, no, it doesn't mean that at all. It means there are no jobs for anyone. If fewer people are coming illegally, it is because there is nothing here. If we ever get to a point where there is an exodus out of here, it means our economy has essentially collapsed. Hooray! As a matter of fact, the flip side is that an increase of undocumented immigrants could well be viewed as an early indicator of economic recovery. The Mexican Congress has begun debating whether to legalize marijuana for personal use. Remember that in February three former presidents (Zedillo, Cardoso, and Gaviria) had been part of a commission that issued a report calling for that very policy. The PRD supports it, and even the Mexican Ambassador to the U.S. has called on the United States at least to debate legalization. It is hard to see this going anywhere at the moment, especially since Felipe Calderón has expressed opposed to the idea. But as drug-related violence increases in Mexico, I would not be surprised to see it get some political legs. The bottom line is how much patience Mexicans have with a U.S.-backed military based policy. Assuming that some sort of vote comes out of this, I will be really curious to see how it shakes out. The Obama administration announced an easing of restrictions on Cuban Americans to travel to Cuba and to send money. In addition, it will seek to make communication easier by allowing U.S. companies to get licenses for Cuba, and to allow Cuban Americans to send cell phones there, among other measures. Nothing revolutionary here (no pun intended). It is simply the use of executive power to ease back, and is a far cry from some sort of generalized unrestricted travel. Nonetheless, this type of incremental policy may well be effective. It is not a big enough change to create major ripples, yet potentially sets the stage for members of Congress to become accustomed to policy reform. The major question that still remains unanswered is what the Obama administration's ultimate goal is, or even if it currently has one. Obama and Biden have consistently said they are not pushing for an end to the embargo, but I would not be surprised if the business community changed their minds, particularly since it would receive bipartisan support. A new CNN poll shows that 64% of Americans think travel to Cuba should be unrestricted, while 71% believe that the U.S. should re-establish diplomatic relations. As always, embargo supporters were vocal in its defense without ever explaining how it can be considered anything but a total failure in achieving its goals. Momentum just keeps building and building. Now that Eduardo Frei is the official Concertación candidate, we'll be seeing all kinds of polls about how he stacks up against Sebastián Piñera. The latest poll shows them in a virtual tie in a second round. Nonetheless, when asked about certain qualities (like "leadership") Piñera is viewed more favorably. As the race has become more clear, Piñera's lead is fading. It is still very early, obviously, so any of these numbers could change considerably. Watching them, though, will be political sport here in Chile for the rest of the year. A quick note to mention that Eduardo Frei won the Concertación's primary, but fared poorly enough and had low enough turnout that no views it as much of a victory. Indeed, he faced a challenge from José Antonio Gómez, a PRSD senator who is now being accused of hurting the coalition by doing so. It almost feels like fatigue is setting in--two decades in power means it's hard to generate any enthusiasm. In a short while I am off to Chile for a vacation with my family, so blogging will be spotty. I have never been to Santiago with kids, so it will be interesting to see their reactions. And if you're around row 23 tonight, I apologize in advance for whatever might happen. In February Senator Richard Lugar publicly stated that the embargo was a failure. Now he has sent a letter to Barack Obama, calling for a special envoy to initiate direct talks with Cuba. He also co-sponsored a bill to end all travel restrictions. He places Cuba policy within the context of national security, arguing that being so out of step with the rest of the world undermines our interests. The end of travel restrictions is now a matter of when, not if. 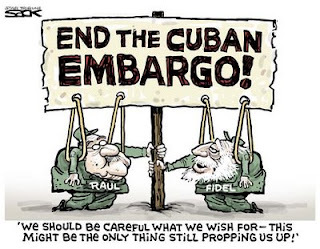 Both Obama and Biden have said they are not going to push for an end to the embargo, but I have a feeling that unlimited travel to Cuba will increase support for ending it. That, too, is a matter of when, not if, but the time horizon could be much longer. The Migration Policy Institute has a new report examining immigration and the current economic crisis. It echoes my own sense that there is no large scale return migration to Mexico. However, it cites one reason I had not contemplated before--the rising level of drug-related violence in Mexico (and in Central America). In other words, it is possible that undocumented immigrants are concerned enough about the violence that it becomes one (of many) reasons to stay in the United States. It makes sense, but I would need to see more evidence about how widespread the concern is. After months of being down, Blogrolling is finally functioning again so I was finally able to update my blog roll. There are, of course, plenty of people who hate Hugo Chávez. Very few, though, create conspiracy theories as entertaining as the one in National Review written by two "former diplomats," one American, one Venezuelan. It is a new domino theory, as it sounds like the first draft could have been written in 1981, then they put in "Hugo Chávez" instead of "Soviet-backed communists." Hugo Chávez does not just fund leftist governments. He controls all of them. He has a plot to take over Central America and Mexico, then funnel drugs and Islamic terrorists into the U.S. I did not make these up. They are really in there. Unfortunately, they did not provide any policy prescriptions, because I think those would have been even more bizarrely fun to read.